Having been in church my whole life, there are lots of terms and phrases that I just accept. They’ve become so ingrained that they are almost clichéd—automatic responses that have lost the potency of their meaning. For some reason as my husband was teaching a Bible study about worship the other day my mind began to turn over a phrase that we often use—Magnify the Lord. If you begin to actually analyze that phrase in the context of Christianity it seems just a touch ridiculous. After all, how is it possible to make God look bigger than He is? Think about that for a second… Surely it’s impossible to exaggerate a God that is all-knowing, all-powerful and everywhere present. This creator of the universe who holds the dust of the earth as if it is a pinch of salt, and yet would robe Himself in flesh for the sole purpose of enduring an ignominious death at the hands of his own creation. We can’t even begin to understand the depth and breadth and height of His love, much less come close to making it seem bigger than it really is. And then another thought struck me. Magnification enables us to see what is really there. We are no longer confined to what we can see with our physical eyes. The same God who set the stars spinning in the vastness of space and declared the seasons is also the same God who formed the most delicate flower petal. He created atoms, protons, electrons and neutrons. Scientists are now saying that there may be something smaller than even these incomprehensibly small units of matter. Every time we think we’ve reached the limits of understanding the natural world, we find there is more to be learned. The same is even truer with God. The deeper we go in Him, the more we realize how much more there is to fathom. I don’t know about you but there have been plenty of times in my life when I’ve wondered why God was allowing a situation. Those are the perfect times to magnify Him! Grab that spiritual microscope that lets us see more than our natural eyes. How do we do it? In worship, in prayer and in digging into His word. So the challenge is this—Magnify God. Pick one attribute or characteristic and study it. Look closely, beyond the surface gloss we’re so familiar with. Down in the nitty gritty. Go deep and then a little deeper still. You may be surprised at what new things you might learn. What’s God been talking to you about lately? Lisa Karon Richardson has been creating stories, since she was little. Influenced by books like The Secret Garden and The Little Princess her early books were heavy on boarding schools and creepy houses. It took her awhile to figure out why grandma thought it was unrealistic for boys and girls to share a room! Now that she’s (mostly) all grown-up she still loves a healthy dash of adventure and excitement in any story she creates, even her real-life story. She’s been a missionary to the Seychelles and Gabon and now that she and her husband are back in America, they are tackling a brand new adventure, starting a daughter-work church in a new city. 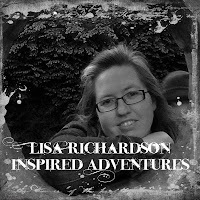 You can also find Lisa at her group blog: http://inkwellinspirations.blogspot.com Her first novella, entitled Impressed by Love, part of the Colonial Courtships collection, is coming in May, 2012. Hurray for the new photo graphics! I love yours, Lisa! When I think about magnifying God I think of it as being the magnifying lens. I do a lousy job at this, but I think about how God is so big that maybe through us, others can see one tiny aspect magnified. We'd probably have to go to the Greek word used to see all of what the writer meant. So if God is all love or all grace, then if we can show someone love when they don't expect it, they might see God through us as though we are the lens. He's just too big to really be SEEN! In my work with insects and plants I'm always amazed at their intricacy. We don't see that unless we look under a microscope. For all their creepiness, there are some incredibly beautiful markings and colors, and surprises to be found. Deb, I love that. I've had similar thoughts in a way about how we see God through a glass, darkly. Our understanding is so limited. But we still have to try to reflect God so that hurting people can see Him. We aren't perfect. But even when the reflection isn't flawless, there's still something so attractive that people can't help but wonder at the beauty of God. Wow, Lisa, this was stunning. As is your new author photo. Very, very nice and captures the real you. As I've mentioned before, I am a closet science geek. I love how God reveals himself in nature. The cellular world fascinates me. Each cell is it's own little microcsm full of amazing organelles and machinery. And while this isn't terribly related, I read the most wonderful story yesterday called "The Artist of Beautiful" by Nathaniel Hawthorne, which was being recommended on Novel Matters. Incredible advice for anyone who creates, but also incredible spiritual tie ins to a mighty creative God. Saturday while the kids and I were at Sonic buying lunch, we got to talking about salvation. What it means. What one must do to be saved. Why we need God. I can't remember what prompted me to say, "Well, kids, I suppose us really understanding God and the Trinity would be like a watch trying to understand it's creator." Sure enough, one kids said, "So we're stupid like a watch." Oh. Okay, so watch wasn't the best analogy. We had a good laugh at that. Lisa, I think you're right in that "magnify the Lord" is one of those catchphrases that Christians say but don't really understand how to really do it. Sometimes I'm not sure I do. There's a popular Christian praise and worship songwriter who writes amazing God-magnifying songs. One day hubby (who was leading worship at the time) said, "Do you realize that SingerName's song always have an I, me, or we in it? Not that the songs are bad or unscriptural." I couldn't help wonder if the songwriter needed humanity to be able to connect with God. Or if he couldn't separate humanity from God. I don't know. And it's possible to craft a God-magnifying song without including an I, you or we (as in people). Dina, I need to read that story. I heard a minister say that we are always magnifying something: ourselves, our problems, or God. We're like auto-zoom cameras... whatever we focus on gets REALLY big! One way I like to magnify Him is to take those words we use (like magnify) and really dig into them, see what they mean in the original language, how they were used and applied. Love the new pic, Lisa! Dina, I'm with you, whether we expand our vision to include the stars, or narrow it to a single atom, God's hand is apparent throughout. That's interesting, Gina. I don't know if we can magnify God without relating it back to ourselves. Probably, but perhaps some of that comes from trying to realize put it all in perspective. Who I am in relation to God. I love to do that too, Niki. It's so rewarding to expand my understanding. Could be partially because I love words so much! Lisa, this is wonderful. 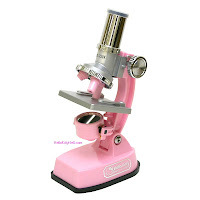 I love the idea of magnifying God through a spiritual microscope. What a clever way of looking at it. Your new pic is adorable! Every year I create 'goody bags' to give away during the Christmas concert. I use donations and Sunday school money so try to get the best deals I can which means buying most of the stuff at the Christian dollar stores. But last year I couldn't find what I needed. For months, I'd thought of the verse that you mentioned about magnifying the Lord and I wanted to give the kids a cheap magnifying glass with that verse on the rim or handle to remind them every time they used it. But I couldn't find one. Then a week before the concert, I was in a regular dollar store looking for anything 'suitable' as an alternative and I found 'oodles' of real magnifying glasses with a 4" non-breakable glass. And my labeler came to mind. Just an hour of my time at home and I had all 48 - yes 48 magnifying glasses sporting the verse on the rim. The kids and parents loved them. Anita Mae, What a clever idea. I love it! Maybe, I'll have to modify this and do a class for my junior high kids. Hmm. Anita Mae, you are just too too clever! This post has been sticking with me Lisa! Deb and Lisa, thanks for saying I'm clever but I can't take the credit. This was a God-thing all the way. I love to meditate on one attribute of God to see where it takes me in my alone time! Magnifying the Lord!!! Now that is an amazing thought!